A reference is invited to the circular issued by Department of Government and Bank Accounts (DGBA.GBD.No.2430/42.01.029/2018-19 dated March 26, 2019) on ‘Annual Closing of Government Accounts - Transactions of Central / State Governments - Special Measures for the Current Financial Year (2018-19)’. March 30, 2019 (Saturday) Normal Clearing as followed on any working Saturday. March 31, 2019 (Sunday) Special Clearing exclusively for Government transactions (receipts and payments) with Return clearing on the same day as per the schedule indicated below. March 30, 2019 (Saturday) One hour after the extended business hours keeping in view the operational convenience at the local centre. Half an hour / one hour after the Presentation clearing keeping in view the operational convenience at the local centre. March 31, 2019 (Sunday) One hour after closure of counters keeping in view the operational convenience at the local centre. Half an hour / one hour after the Presentation clearing keeping in view the operational convenience at the local centre. 3. It is mandatory for all banks to participate in the Special Clearing operations on the above specified dates. All member banks of the clearing houses are required to keep their inward clearing processing infrastructure open during the Special Clearing hours and maintain sufficient balance in their clearing settlement account to meet settlement obligations arising out of the Special Clearing. 4. 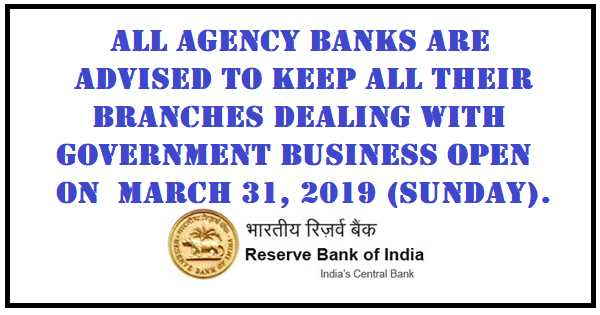 Member banks of clearing houses are advised to adhere to the instructions contained in this circular as well as the instructions received from the Regional Offices of Reserve Bank of India and President of respective clearing houses. In case of image-based clearing at CTS locations, separate operating procedure will be decided for March 30 and 31, 2019 and advised to all member banks by the President of the respective CTS location. Member banks may also be guided by the circular NPCI/2016-17/CTS/Circular No.32 dated October 3, 2016 issued by NPCI to all member banks regarding clearing type for instruments to be presented in Special Clearing sessions. 5. Member banks are also advised to be in readiness to participate in the Centralised Payment Systems (RTGS and NEFT) on March 30 and 31, 2019. A separate broadcast message in this regard will be issued through the respective systems indicating the extended time window.